A starting capital of $100,000 at inception on 1/2/2009 would have grown to $413,717 which includes $1,922 cash and excludes $10,605 spent on fees and slippage. The starting capital of $100,000 at inception on 2/3/2014 would have grown to $112,511 which includes $1,839 in cash and excludes $408 in fees and slippage. 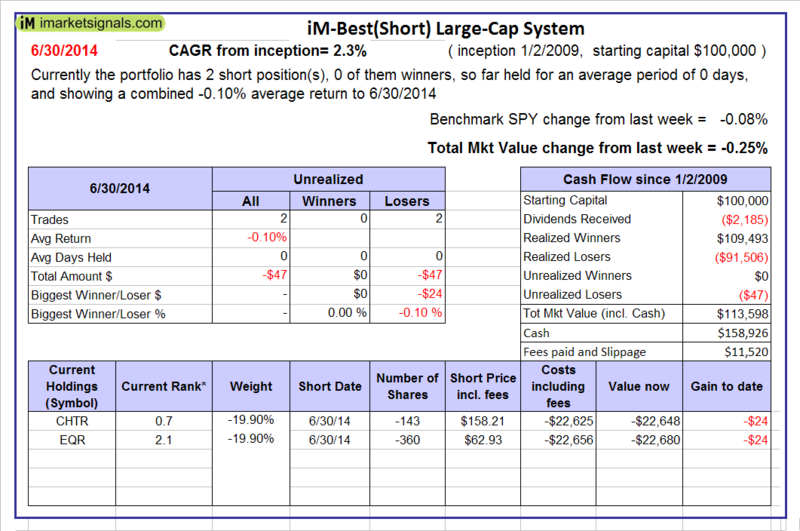 The iM-Best(Short) position for Monday 6/30/2014: CHTR and EQR. 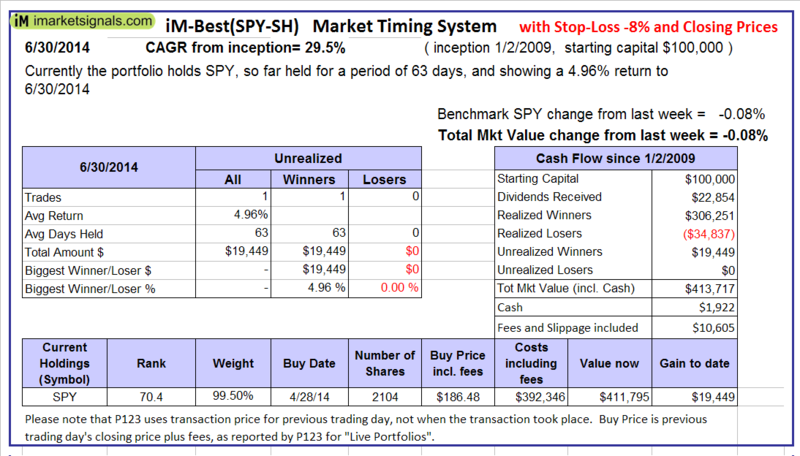 Over the previous week the market value of Best(Short) lost 0.25%% while SPY lost 0.08%. Over the period 1/2/2009 to 6/30/2014 the starting capital of $100,000 would have grown to $113,598 which is net of $11,520 fees and slippage. The iM-Best12(USVM)-July-2014 invested $100,000 in 12 positions. Georg in the iM-Best 12 USMV model, does the 7/7 update reflect the most current rankings (what you would buy if you were starting tomorrow), or is it applying the one year hold rule you used in your modelling and therefore not changing anything from 6/30? Thanks. 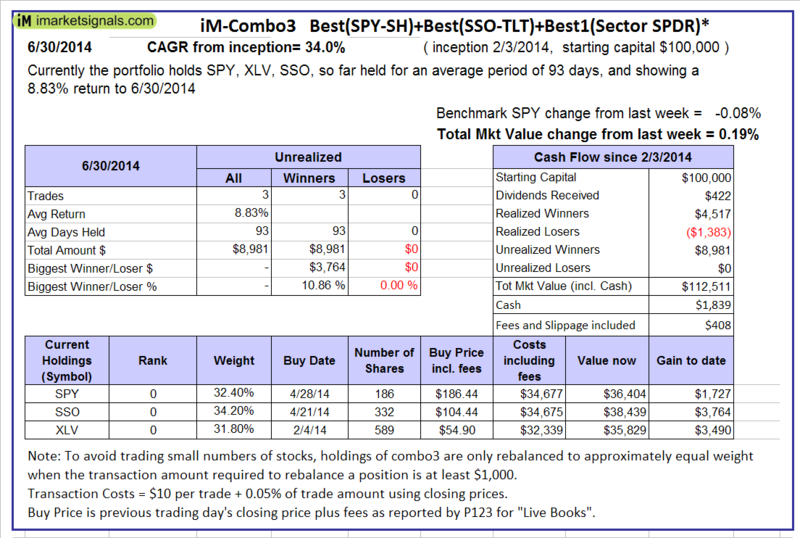 Tom, we started the July model on Monday 6/30/14 with the holdings as per table. The holdings will not change for 1-year (unless a position loses more than 15%), although the rankings will change over time. We will not update the table and the 7/7/14 update will reflect only the value of the portfolio on that date.